Let me first clear the air: Passover and I didn’t always get along. I used to dread its arrival—and then pout through the eight days until it ended, along with its unwelcome dietary restrictions. No bread or pasta? How was young, picky-eater me supposed to feel about this “holiday”? But then again, that’s kind of the point. Passover celebrates the story of the exodus from Egypt: from baby Moses in a basket to the 10 plagues to the parting of the sea. The amended no chametz diet—meaning nothing leavened—serves as an ever-present reminder of that tale. The fleeing Jews didn’t have time for their bread to rise; the dough baked in the sun on their backs as they walked, giving them matzo instead. (A lousy stand-in, if you ask me.) And so, more than three millennia later, we too eat matzo. Those were the years I mostly subsisted on matzo ball soup, Manischewitz boxed coffee cake mix and dreams of the pizza that awaited me at the end of it all. My family would pile in our minivan and drive up to Toronto to spend the seders—held on the first two nights of Passover—with my mom’s family. My excitement to see everyone and stay up late (seders extended well beyond my bedtime back then) was always enough to get me through the nine-hour drive from downstate NY...but there was no such relief for the trip back home. Just home-packed meals eaten at rest stops while staring wistfully at the Golden Arches. Time passed, and my picky eating habits faded. Cutting out chametz for eight days wasn’t that hard anymore. My parents started hosting our seders, with people spilling out of our dining room, instead of traveling to them. My brother and I headed off to college and beyond, but no matter what, found our way home each Passover. Caterer Amy Phillips kept her matzo ball soup simple with carrot noodles and fresh parsley. The shift happened so subtly and slowly that it caught me off-guard: Passover had become the holiday I counted down to, not away from. When curious friends and coworkers want to know more, I like to joke that it’s our Jewish Thanksgiving—a time for my family to come together and share a scrumptious feast I dream about all year long. The analogy is too perfectly the Osshers not to invoke. Thanksgiving was a later-in-life tradition for us, one my brother and I started in our teens. My dad grew up in South Africa, my mom in Canada—so our extended family would gather for seders just like my friends’ families do at Thanksgiving. And long before we were doling out who would be responsible for the stuffing and gravy, the four of us were in the kitchen cooking up a Passover feast. For a fresh spin on a tradition, Phillips deep-fried gefilte fish and served it atop beet hummus. Food is deeply entwined in Jewish traditions, and Passover is a pinnacle. Ingredients embody symbolic meanings on the seder plate, and each plays a role in the seder as the story of Exodus unfolds. Added bonus: It means a few prerequisite bites of food before dinner (to go along with the wine). 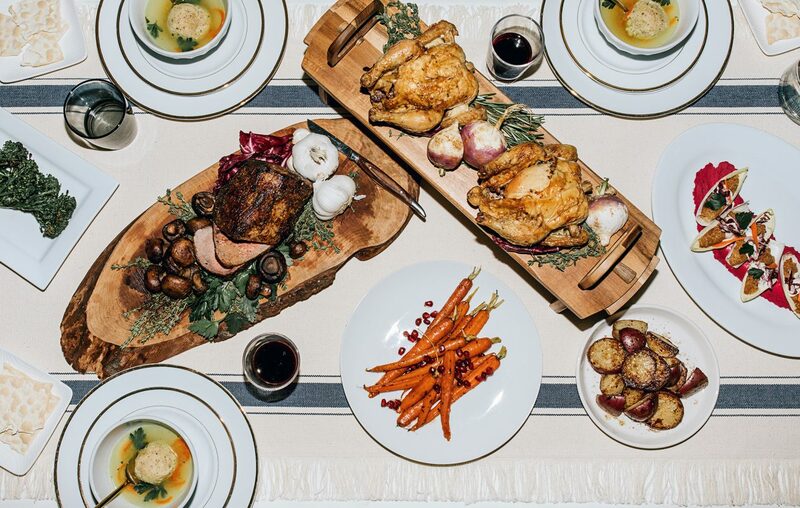 Dinner is also an ingrained part of the seder, not an afterthought to address once it’s over—shulchan orech, or “the meal is served,” is step 11 in the sequence of 15 that define the order of the evening. Dessert is technically covered, too, as part of step 12...though whether plain matzo can be called such is up for debate yearly at our table. That’s when the afikoman (a piece of matzo that was hidden earlier on) is found hide-and-seek style and shared before saying the post-meal blessing. Our Passover menu is packed with meaning, some specific to this holiday while others a universal staple of Jewish gatherings—but all important to us. My family is partial to the four-course lineup we’ve recently perfected. Then it’s time for matzo ball soup—and no one makes it better than my mom. Yes, I’m biased, but hers is so beloved that she now starts making matzo balls by hand over a month in advance to ensure she’ll have enough to send everyone home with. The pillowy-light results deserve only the best, so we cook up a few batches of scratch-made chicken broth for them to float in. Worth the extra effort, without question. As everyone devours their soup, out comes the full dinner spread. The showstopper is a brisket so good my husband begs for it year-round. (We tested recipe after recipe in our search for the perfect one.) But there’s also roasted chicken and potatoes, various vegetable patties, like potato leek and cauliflower, and kugel, a Jewish baked casserole of many varieties. Phillips made her own matzo bark with dried apricots, craisins and pistachios. Chocolate covered matzo and macaroons are go-to Passover desserts; Sarah Bernhardts (topped here in gold leaf) are a family favorite. Before turning back to our seder, we like to indulge in some proper dessert—which, at Passover, can often be lackluster given the dietary restrictions, but has no need to be. For us, that means Sarah Bernhardt cookies (almond macaroon and chocolate mousse covered in chocolate), giant coconut macaroons half-dipped in chocolate and, of course, chocolate covered matzo. And now our best-kept Passover secret is out: What we’re actually serving is a course-by-course lineup of family favorites. Just like with Thanksgiving, it’s a table full of dishes we constantly crave—and the excitement to come together as a family to cook and eat it once again is part of what makes the holiday so special. The four-phase approach to Passover dinner serves a necessary behind-the-scenes function as well: It’s a time management hack we needed to feed our guests while also participating in the seder itself. Eggs in salt water are prepped in advance and quickly assembled while the main courses are popped in the oven to heat; the matzo ball soup keeping warm on the stove throughout the evening.